The term “content engagement” gets thrown around a lot. I get that. Why would we be creating content if we didn’t want people to engage with it? But what, in all seriousness, does engagement actually mean? “Clicks,” “social shares,” and “time on page” are phrases I often hear when companies talk about how they measure engagement, but how accurately do metrics like these disclose how – or if – people are interacting with our content? Stick with me and you’ll find out what engagement really means and what you need to be measuring to see if your content is engaging. Your content’s “reach” is determined by the number of people that see it – even if only for a moment. It’s a vanity metric. It means little. 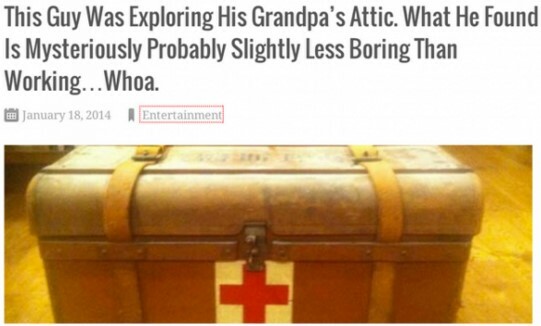 Clickbait is a way for publishers to boost clicks by slapping an enticing yet misleading title onto a piece of content. This tactic might drive more visitors to a site, but what happens next? Annoyed by the false premise on which they were led to the site, they are likely to leave quickly. Does that brief interaction with the content make it a success? Reach also can be artificially manipulated with the use of paid content-promotion ads. They help get your content in front of a targeted audience quickly and cheaply, and that’s awesome, but you can’t necessarily label your content a success because you paid to get traffic to it. You need to do something with that traffic. I think it’s safe to assume that most of us aren’t creating content in the hope that people will visit, read, and leave – no matter how “engaged” they are. We want people to take action when they visit. Create a call to action that you want people to complete after they read your content (newsletter sign-ups is a good one) and track how well that performs instead of how far your content reaches. “Time on page” sounds like a much better measure of engagement than “reach.” If someone spends a minute or more on a page, we can safely assume they were reading and absorbing – engaging with our content. Can’t we? Time on page is a heavily skewed metric for a couple of key reasons. In website analytics, the “time on page” is calculated based on visitors who did not bounce. If someone came, saw, and went within the bounce time, their visit to the page is not factored into time on page. This statistic reveals only those who interacted with the site longer than the bounce time. Time on page is calculated on the time between the visit to the first page and the next page. This would be fine if we all browsed a site in a single-session, linear mode – clicking links to other pages and leaving when we’re done. But we don’t. We open multiple tabs. We walk away from devices. We become distracted when in front of a screen. That can artificially inflate our time on page. There are so many variables to how we browse a website that Google (or any analytics tool) does not account for. This makes time on page a questionable metric at best. Scroll depth measures how far down a page a visitor scrolls. It’s not foolproof, but if most of your visitors are making it to the end of your posts, you should be safe to assume you’re doing something right. Crazy Egg’s heat maps (in full disclosure, Neil Patel is my business partner, and this is his tool) can tell you how far down a page visitors scroll (and lots more). For a free (albeit less-detailed) way to measure scroll depth, try WordPress’ Scroll Depth plug-in, which hooks into your analytics. 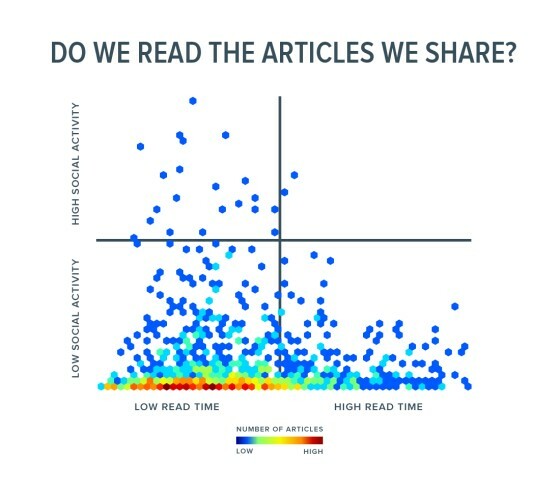 We’ve established that reach and time on page aren’t the most reliable metrics by which you can measure content engagement, but what about shares? Surely, people share content that they’ve read and that has resonated with them in some way? Tony Haile of Chartbeat revealed in his Time magazine article, What You Think You Know About the Web Is Wrong, that there is little correlation between the articles we read and the articles we share. As Haile shared, the story with the longest engagement time had fewer than 100 “likes” and 50 tweets. And visitors to the story with the largest number of tweets read it for only one-fifth of the time of the story with the longest engagement. “Bottom line, measuring social sharing is great for understanding social sharing, but if you’re using that to understand which content is capturing more of someone’s attention, you’re going beyond (that) data,” Haile wrote. Do you want people to share your content? Of course you do. Shares help content reach more people. 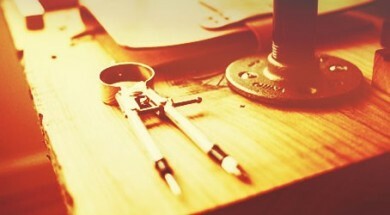 But should you rely on share stats to measure the success of your content? Probably not. Is Your Social Media Content as Popular as You Think? Visitors don’t comment on your content unless they are genuinely engaged with it (or they’re spammers, but I hope that you’ve taken steps to prevent that). In all forms of marketing – online or offline, paid or organic, local or international – we need to be taking steps to understand what is and isn’t working. If we don’t we might as well withdraw our budget dollars from the bank, set them alight, and throw them off the nearest bridge. We need to measure engagement the right way because we need to understand how people are really responding to our content. It’s not how many times they click “like” on a Facebook post. It’s not how many people are being driven to a page. Engagement is about how involved people are with the content you create and promote to them. If you believe this, you will measure to learn what’s working and what’s not, and harness this knowledge to ensure that each piece of content you create is that little bit better than the last. What metrics do you use for monitoring engagement? What do you do with the results? Please take a minute to share your thoughts with me in the comments. Measurement is one of the five core elements for running successful, scalable content marketing operations. Read our 2016 Content Marketing Framework: 5 Building Blocks for Profitable, Scalable Operations for an overview of the full strategic blueprint. Andrew is the co-founder and director of Online Marketing Gurus, a fast-growing, award-winning search company working with brands including HelloMolly, Baku Swimwear, and Forcast. Follow him on Twitter at @andrewraso1 or on LinkedIn.